Routine continuous Electronic Fetal Monitoring (EFM) provides no benefit for babies and increases the risk of instrumental (e.g. use of forceps) vaginal births and cesarean deliveries. The American College of Obstetricians and Gynecologists (ACOG) recommends that for healthy, low-risk births (most births), fetal heart rate be monitored with a fetoscope or Doppler stethoscope every 30 minutes in active labor and every 15 minutes during pushing. The World Health Organization (WHO) encourages intermittent manual listening and warns that EFM is often used inappropriately. Your labor is induced or sped up with Pitocin. Your baby’s heart rate changes. You or your baby has a health problem. 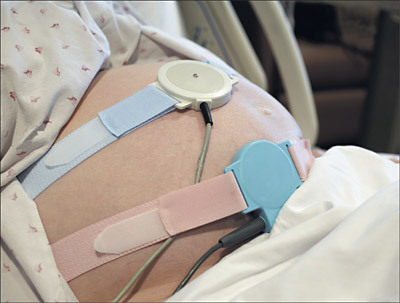 Remember that routine use of continuous EFM doesn’t make labor safer for your baby. Find a caregiver who doesn’t use continuous EFM routinely. Talk to your caregiver about intermittent fetal monitoring. Stay at home as long as possible in labor. Remember that your body knows how to protect your baby during labor. Continue to move as much as possible, both in and out of bed. Ask staff to turn off the monitor’s sound. Ask staff to turn the monitor away from you and your helpers so it doesn’t distract you. Ask for a telemetry monitor (that is, one that's not attached by wires to the machine). Ask to be disconnected from the monitor for regular trips to the toilet. Remind your helpers that you are the one in labor, not the machine.